The crude price started to increase after mid-2016 and had gain some momentum in 2017, especially toward the end of the year. 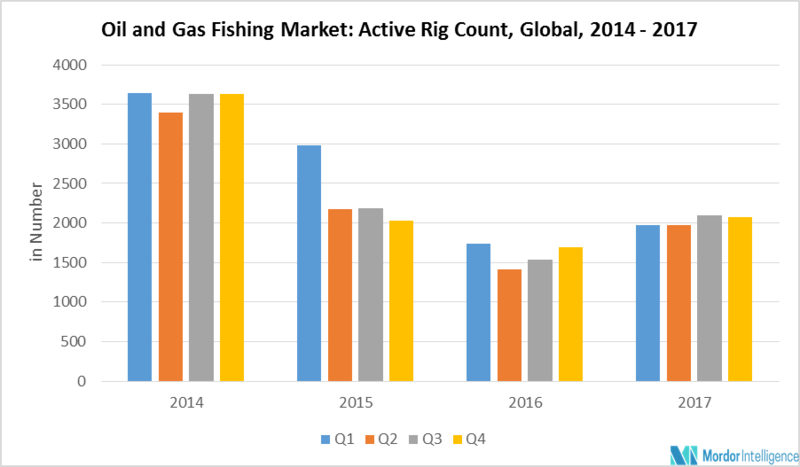 The oil & gas fishing market has also followed the same trend. Further, in 2018, crude oil price is expected to strengthen more with increased activity from countries, such as the United States, Brazil, Argentina, Nigeria, Iran, and Iraq. The increased activity in the upstream sector results in a rise in the chances of junk, debris, and fish in the wellbore. As a result, the demand for fishing operation is also expected to increase. The crude oil price had shown some volatility in the beginning of 2018, when the price declined from over USD 72 barrel per day (bpd) to USD 62 bpd, in just two weeks. Saudi Arabia is one of the major crude oil producers in the world, accounting for 13.4% of the global oil production. The country has retained its focus on reducing the excess oil inventories. It is expected to reduce its production by 100,000 bpd in March 2018, in response to OPEC’s last meeting in November 2017. OPEC has extended its oil production cut until the end of 2018. The expected decline in production is expected to negatively affect the oil & gas fishing market in the short term. Brazil and Argentina are one of the major countries in South America’s oil & gas industry. They account for around 47% of rig count and 43% of crude oil production in the region. Both the countries had faced lack of investment or disinvestment in the upstream sector in the past few years, before the new government came into power. In Argentina, the government had reduced high subsidies on natural gas, gasoline, and electricity prices in 2016. The government is planning to eliminate natural gas subsidies by 2022 and increase the prices for upstream gas producers, to attract sufficient investment in production. In Brazil, the new conservative government has introduced several reforms such as ending Petrobras’ monopoly over the country’s prolific hydrocarbon resources and has opened the hydrocarbon reserves to foreign companies as well. The country is aiming for additional oil production capacity of around 2 MMb/d by 2027, that too mostly from deepwater. The recovery of the Brazilian and Argentine upstream oil & gas sector is expected to push the demand for fishing activity in the region. As of January 2018, the United States has 947 active rigs and more than a million producing wells, and is one of the largest market for fishing in the world. Drilling activity in the United States in 2018 seems to be positive, with the addition of 51 active rig counts in the first 40 days of 2018. Also, the government has opened around 98% its coastal water for drilling, which was earlier not allowed. As a result, the drilling activity is expected to further increase. With the increase in drilling activity, fishing for junks, debris, and fish will also increase. Ramping up of production in the UK and Norway after years of decline, is also driving the oil & gas fishing market. January 2017: Schlumberger acquired Peak Well System, which is a specialist in the design and development of advanced downhole tools for well intervention, flow control, and well integrity. MAJOR PLAYERS: Schlumberger Limited, Weatherford International PLC, Baker Hughes, A GE Co., Halliburton Company, National Oilwell Varco, Expro Group, Archer, Odfjell Well Services, and Wellsite Fishing & Rental Services, among others. 9.3 Baker Hughes, A GE Co.